HAVE YOU EVER TRIED TO STOP THE RAIN? "Have You Ever Tried To Stop The Rain?" 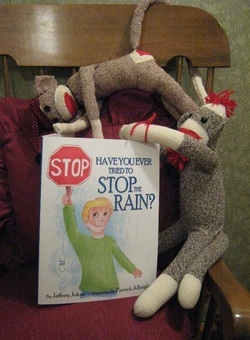 is my first published book and is a playful story of a young boy trying everything in his power to stop the rain. This rhyming book takes us through a journey of a child's imagination as we all discover if there really is a way to chase away those storm clouds. The book is available onliine at Amazon.com or barnesandnoble.com. You can also order it in the contact information section of my site for $11.00 plus $2.00 shipping and handling. The hardcover version is only available on my site and is $17.00 plus $3.00 shipping and handling. Here's a few pages from the book - I hope you enjoy! Preview Of "Have You Ever Tried To Stop The Rain?" A photo of one of my book readings for the 3rd Graders at Orange Grove Elementary School in Anaheim, CA.